"Man I loved playing ball at the Rucker last night. Street ball is where it's at people. If you can hang there, you can hang anywhere!" That's what the long time scoring champion of the NBA, Kevin Durant (KD) said after his first ever game in the legendary Rucker Park in New York where the likes of Sebastian Telfair, Brandon Jennings, Jamal Crawford, Stephon Marbury and many other well known personalities in the NBA. 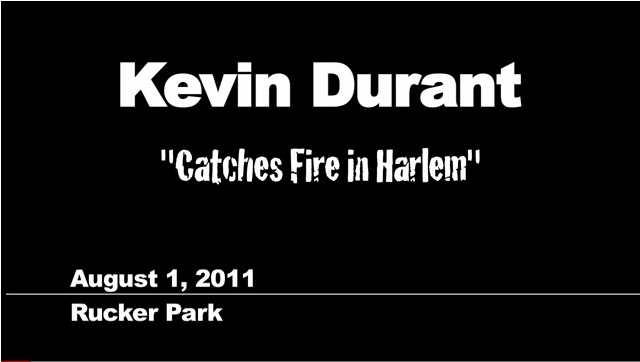 In his first ever visit at the Rucker Park, KD dropped 66 points all in all. It was highlighted by the 4 straight three pointers that he made in front of his defenders. That's how Durantula operates. Scary. But still KD's output was still a bit far from the 74 points that Joe "The Destroyer" Hammond set a long time ago. That has been the longest standing scoring record in Rucker Park. Here's a video of KD's 4 straight 3 pointers that he made in the game.